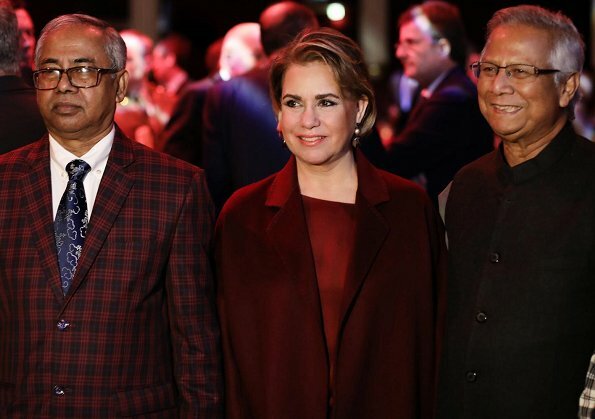 Grand Duchess Maria Teresa of Luxembourg attended celebrations of 10th anniversary of Grameen Crédit Agricole Foundation (FGCA) in Paris. 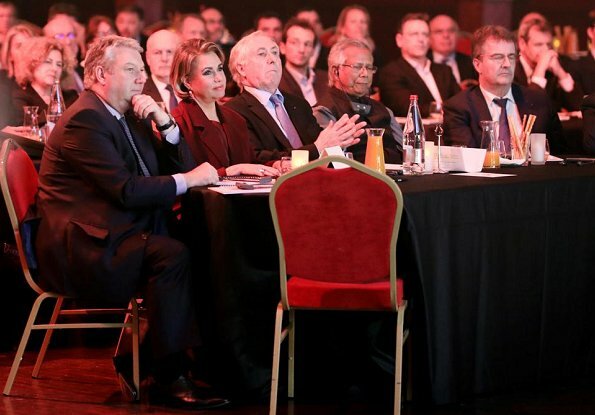 Created in 2008 under the joint leadership of Crédit Agricole S.A. and Prof. Yunus, 2006 Nobel Peace Prize laureate and founder of Grameen Bank, FGCA is a foundation headquartered in Luxembourg. 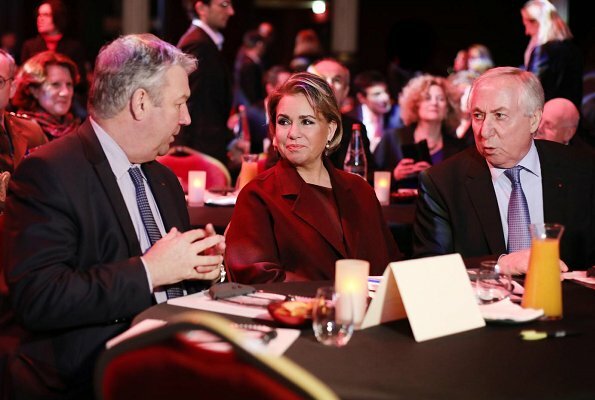 The Grand Duchess joined the Board of Directors in the year of its creation. FGCA’s mission is to contribute to the fight against poverty by financing and supporting microfinance institutions (MFIs), social enterprises and projects that promote inclusive finance and rural economy development all around the world. She looks great. Her makeup, often overdone, looks great here. Maria Teresa looks very nice today lovely coat and top. Burgundy is obviously the colour of the season. 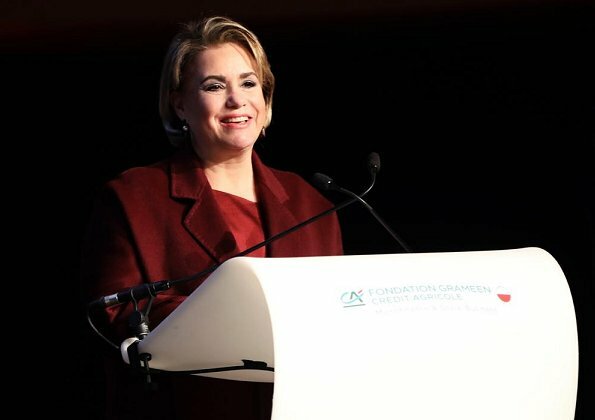 Maria Teresa looks wonderful! I also like her hairstyle . Burgundy colour very in, I like it too, but today's hairstyling was probably not done on that day, not appealing to me. Looking good - I like the toning burgundy shades and prefer her hair styled like this. Nice colour that works well with her complexion. And much better makeup (maybe she can explain the advantages of less black contouring to Kate too. She would look so less tired). A hat trick of successful burgundy outfits this week. The Grand Duchess is looking great. Agree that the lighter make up is an improvement. 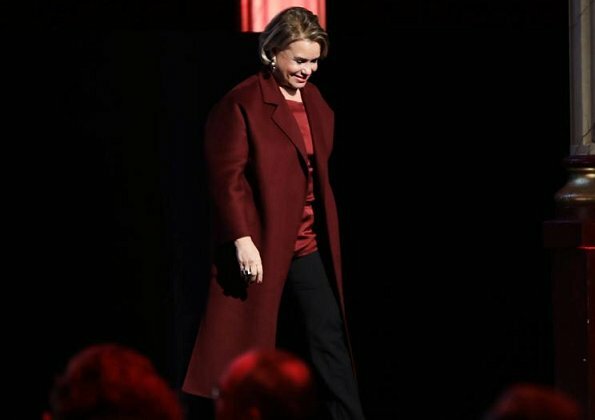 Very stylish coat and she combination looks good. She looks great in these colors. The hair looks lovely when she wears it down on her face a bit and not slicked back.